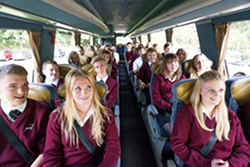 We are proud to hold ongoing contracts with Hertfordshire County Council, Central Bedfordshire, Cambridgeshire County Council and private parent groups, on a typical day we transport around 1900 pupils on home to school contracts. We carry out many bookings and contracts with some of North Hertfordshires most renowned schools and collages. 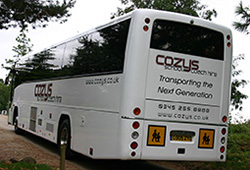 We can cater for all your coach travel needs from day trips to residential, daily pick-ups through to after school activities. Whether it is a long-term contract or a one off trip, speak to us about your requirements and we can help to arrange a package that suits you. We have a School Information Pack available which contains a full Risk Assesment when planning your trip. Please contact us for your copy or click on the links on the right. 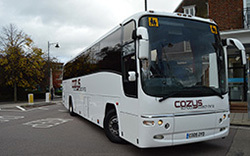 Cozys would like to ask you to please bear in mind when obtaining prices that we operate a modern fleet of coaches, all of which are fitted with the latest safety devices, including ABS (anti-lock braking systems), ASR (anti-slip restrictor), R66 (roll-over protection bars) and all are fully seatbelted, as required by local eductation authorities. Our vehicle record is second to none, and all our drivers are fully DBS checked. All vehicles are maintained to the highest standard regardless of cost. We also have an excellent backup system in place in the unlikely event that a breakdown should occur.